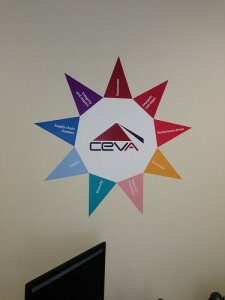 Interior Wall Logos…Compliment Your Decor! There are many ways now to add graphics to your interior wall space! If you’re tire of that empty space staring back at you, consider adding something that will help sell your business! Metallic Letters make your logo shine!…literally! We can do everything from Dimensional lettering in almost any color including Gold and Silver, and we can custom cut nearly any shape! 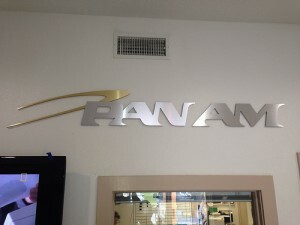 Pan Am International Flight School wanted a gold and silver version of their logo and it came out great! We can also use a permanent or temporary adhesive label or decal to put an attractive graphic up on your wall. These can be cut in any shape you desire and the right material is easy for anyone to install! Have a wall you don’t know what to do with? Give us a call for a free consultation and proposal!